Thank you to everyone who entered my “Beautiful Bridges and Special Kisses” giveaway. I loved reading about your favorite bridge and your most special kiss, both on your blogs and in your comments! The five winners of a collection of ten Amish novels are . . .
Amy Bateman: Amy shared her favorite bridge, which is in Omaha, Nebraska! It crosses the Missouri River, so you can technically be in two places at once: Nebraska and Iowa! This bridge is going on my list of places to check out. Jennifer Smith: Jennifer shared her special kiss: with her newborn son! After five years of trying to get pregnant, Jen and her husband finally welcomed their newborn son into the world. Such a sweet story! Rachel DeVaugn: Rachel shared a story of weight loss and her grandpa being able to give her a kiss no matter what the number on the scale said. So inspiring! Audrey Grant: Audrey’s story is a bit different. When she was younger, she was scared of bridges, water, and drowning. She faced her fear on what is now her favorite bridge and through that experience came to know Jesus as her Lord and Savior! Tori Close: Tori’s favorite bridge is in my old hometown of Kalispell, MT. Tori shares a beautiful story of faith you have to read. Winners, please email your mailing address my assistant Caitlin to claim your prizes! 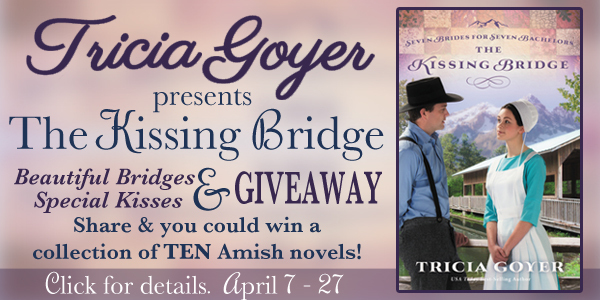 Congrats to the winners of @TriciaGoyer’s The Kissing Bridge #giveaway! Read about my beautiful bridge and special kiss! THANK YOU for supporting the latest release in my Amish series Seven Brides for Seven Bachelors. The Kissing Bridge is the story of a young woman caught between a stifling Amish community and the unnerving outside world and the daredevil bachelor determined to find an Amish woman who can quench his thirst for adventure. Find out more here. How exciting! 🙂 Thank you, Tricia. Wow, thank you!! Congratulations to all the other winners! Someday when you do make it to Omaha to see “my” bridge, I hope I get the chance to meet you in person! Thanks for the opportunity of the bridge contest. Congrats to all the winners. P.S. Sorry I spelled your name wrong when I sent my address. I realized I did it just as I hit the “Send” button. LOL! !